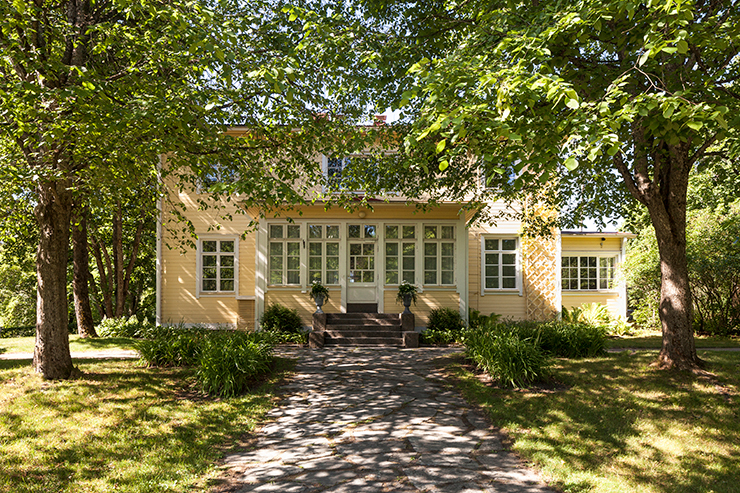 Architects Gullstén-Inkinen helped revamp a traditional manor estate owned by a Finnish company in Espoo, Finland. 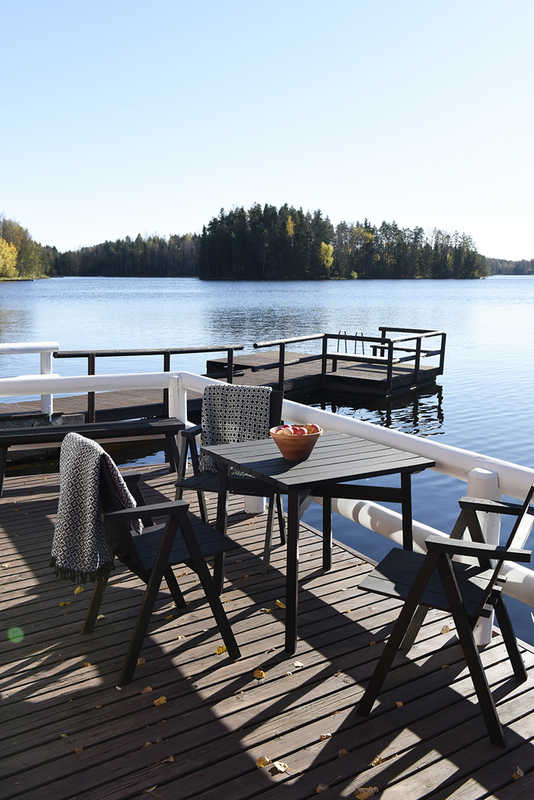 Gullstén-Inkinen was responsible for the architectural and interior design of the property. 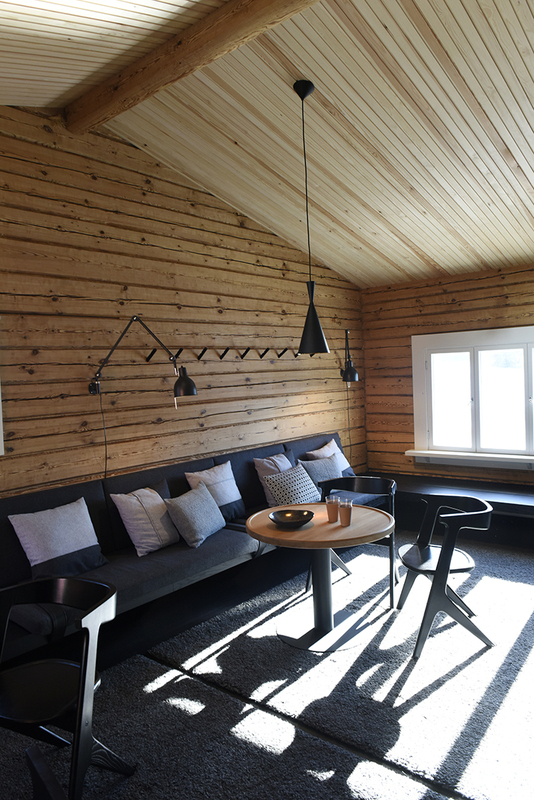 The main house, completed in the end of 1920s and its sauna cabins received a new lighter, more cozy look. 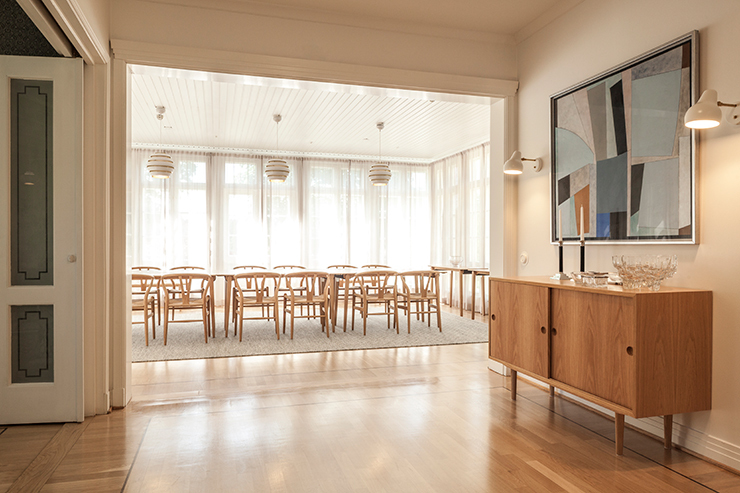 The objective of the main building’s interior design was to create a mood reminiscent of a lovely summer day in 1952, the year when the Olympic Games were held in Helsinki. There’s a beautiful sun room that welcomes visitors to the main house built in the end of 1920s. Large windows facing three directions create an extremely well-lit entrance. Stepping further, the visitor finds a view to the dining room located in a sun room on the opposite side of the house. This room also features tall windows facing three directions that let plenty of sunlight into the building. Latest renovation emphasizes the luminosity and lightness of the manor. This particular project included the main house of the estate. 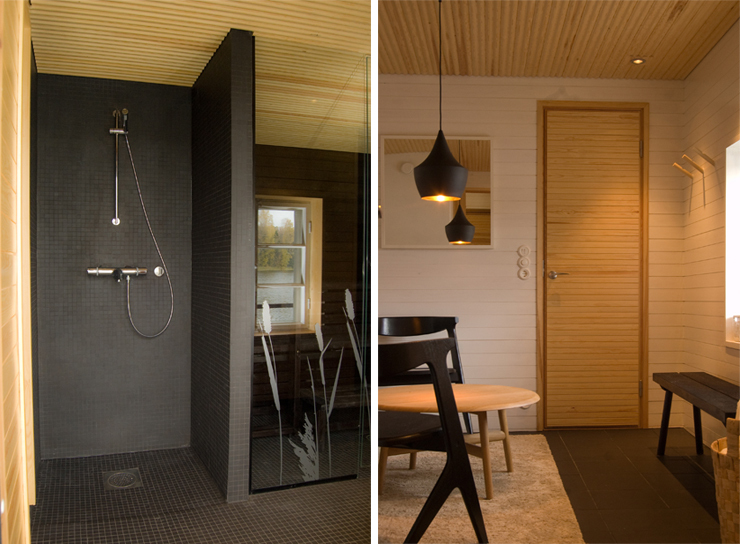 A few years earlier, the two log-cabin saunas by the lake went through complete renovation. 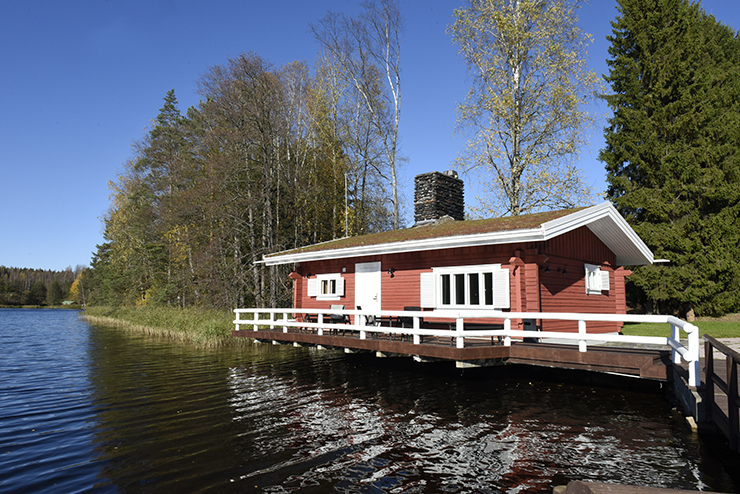 Now the manor owned by a Finnish company is again ready to receive guests, to house meetings and dinners and to provide traditional bathing in the sauna cabins. A well-lit entrance welcomes the visitor. The entrance provides a view to the dining room. The manor houses an art collection now on display. The appearance of the dining room that seats 16 persons was lightened and streamlined. Y chairs replace the old black leather chairs. A display cabinet presents the company’s monogrammed crystalware from decades ago. 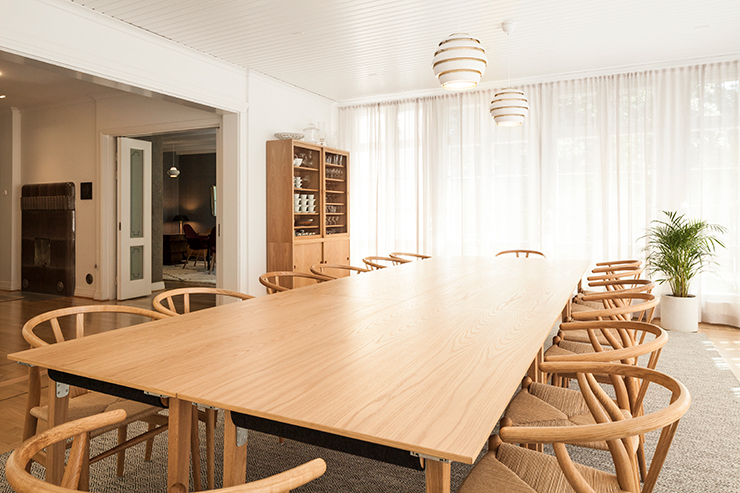 Architects Gullstén-Inkinen were responsible for the architectural and interior design as well as the project management and procurements of the renovation. Thirty years had passed since the previous renovation of the manor, and its interior was wearing off. Entertaining functionality was another dimension that needed improvement. “It was the client’s wish to make the manor a cozy place to stay. Although we’re talking about a space for executive entertainment, the house itself is kindly and modestly sizes. 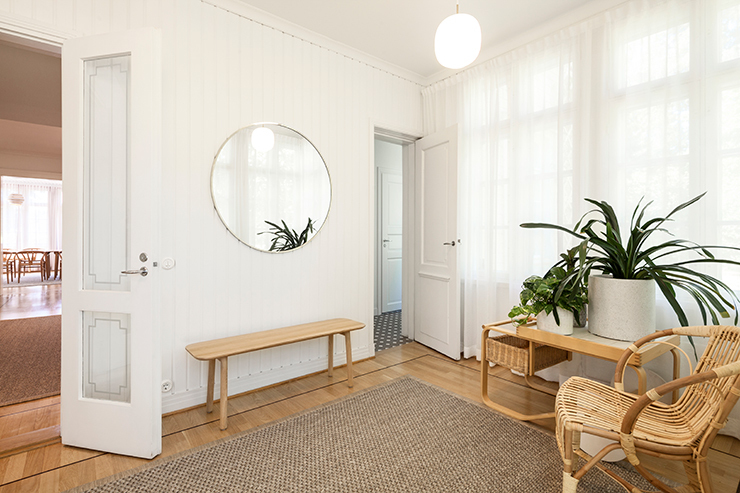 Coziness fits the frame of the house,” says Hanna Gullstén. What period should the interior design style represent? “We pondered about this for a long while. The manor carries a long history, and there were several layers to choose from. We liked the idea of a bourgeois home in the days of the Olympic Games in 1952. All items have been selected to reflect the spirit of that time. Because of the tight schedule, we didn’t have time to look for antique furniture, so the mood was created with new furniture representing the period. We preferred Finnish and Nordic products. 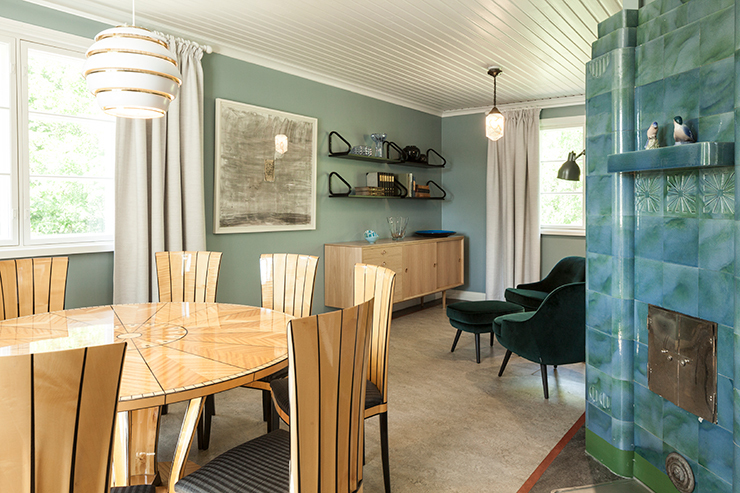 The original pieces of furniture in the house were repaired, and the art and tableware available were put on display,” Hanna Gullstén explains. The hall downstairs functions as a salon for after-dinner coffee. It includes an original fireplace that provided a base for the colour selections. The manor’s art collection also helped pick the right colours. “There was plenty of beautiful art available in the manor. The client was pleased that we were able to place all of it in the interior. For example, a work that features a keyboard was placed on top of the piano in the hall. We chose many of the textiles based on the tones of the artwork,” says Hanna Gullstén. The colours in the hall were matched with the fireplace, the art and the existing furniture. An original sofa set was restored and upholstered. A table from the 1930s includes several secret drawers and bottle-holders. The idea was to make the house look like it was recently inhabited. Somebody has “forgotten” their spectacles on a stack of books. A Berber rug in the style of Villa Mairea creates consistency in the large space. Eliel Saarinen’s Cranbrook dining set dominates the upstairs of the manor. 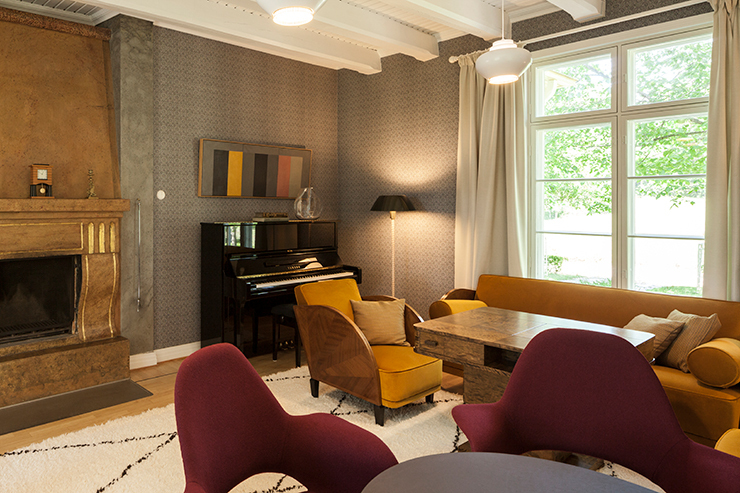 The colours of the original tiled stove inspired the tones of the walls and the armchairs. Old objects from the company’s collections have been placed on Artek’s shelves. 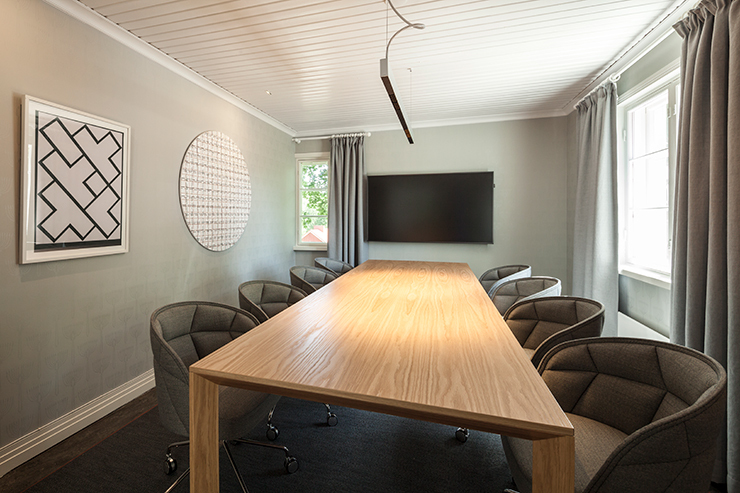 The meeting room for eight upstairs was styled modern in terms of appearance and artwork selection. 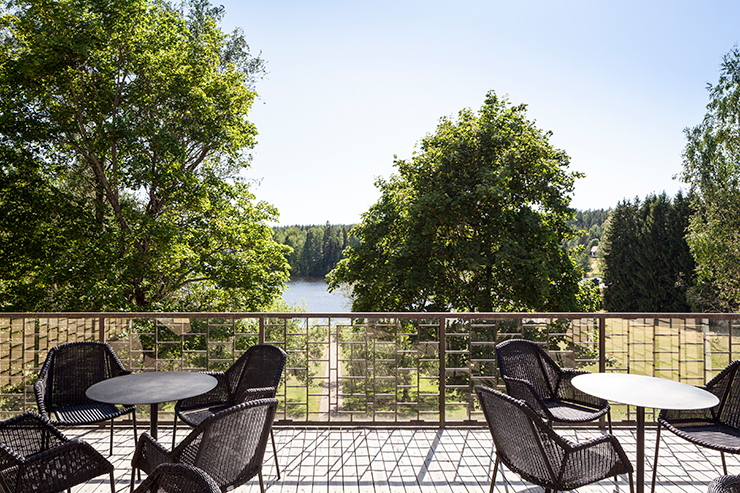 The terrace above the dining room provides a great view towards the lake. The manor includes two log-cabin saunas by the lake. One of them was renovated in the spring of 2010 and the other in 2017. “The renovation project of the manor estate started in 2010, and its first part was the so called ladies’ sauna. 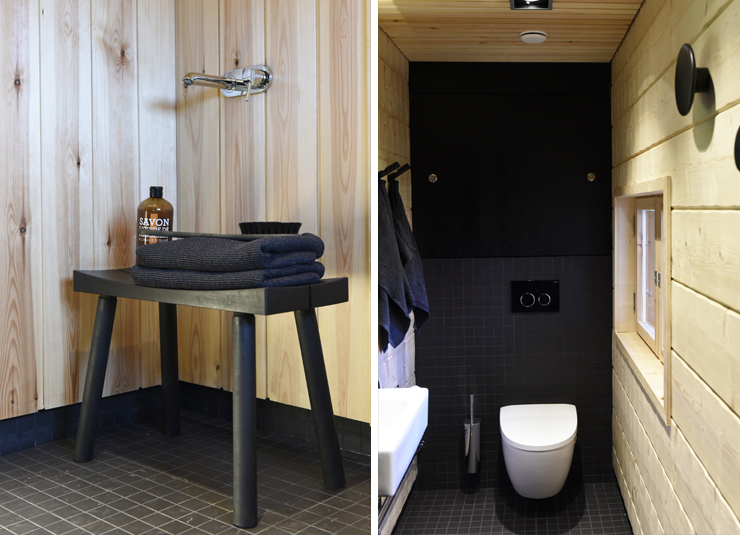 The objective was to create a stylish yet cozy sauna space for entertaining guests. 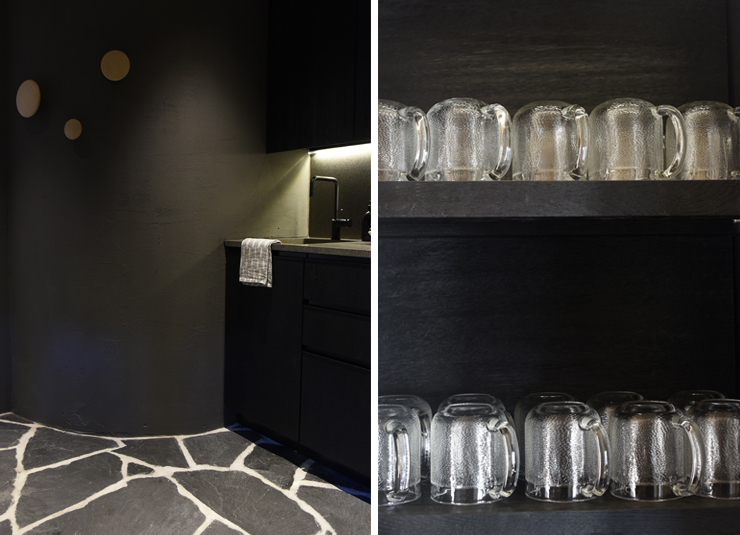 We wanted to create a modern, well-lit and feminine space,” Hanna Gullstén says. The original look of the building including the roof and cladding remained nearly the same, but the building frame and interiors were almost completely renewed. During the renovation, it was observed that the sauna had been built in several phases and that its oldest part used to be a smoke sauna. The idea was to install light wood paneling in the dressing room. 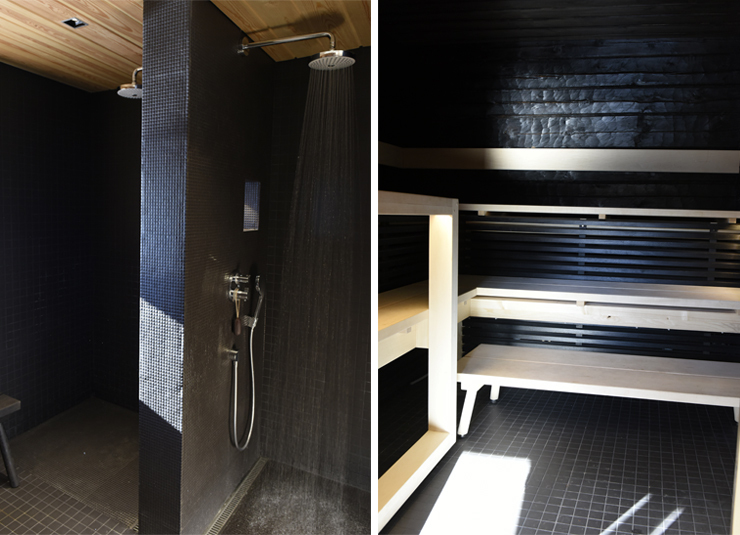 The men’s sauna, which represented 1950s architecture, was lastly renovated including a major structural update to improve its functionality. 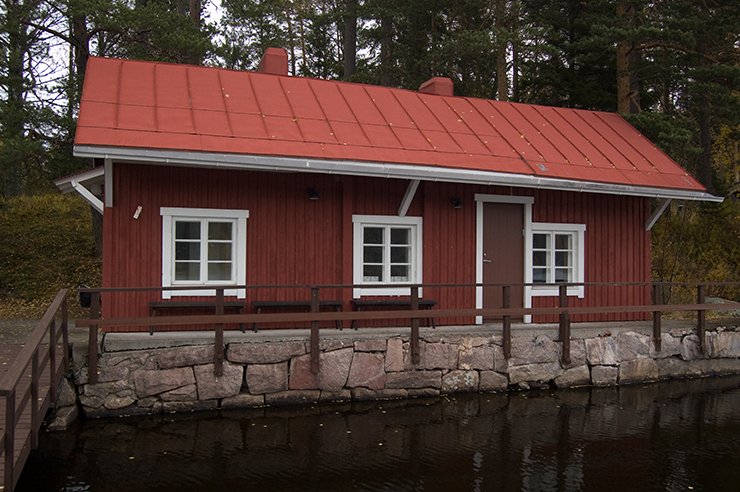 The foundation of the men’s sauna was restored, and the waste water and heating systems were modernized. An old grass roof was completely rebuilt, and a major renewal took place indoors. The logs in the walls were mainly in a good condition, so they were just cleaned. The steam room has a fine old wood-burning sauna stove, and the benches were renewed with the help of highly skilled carpenters. 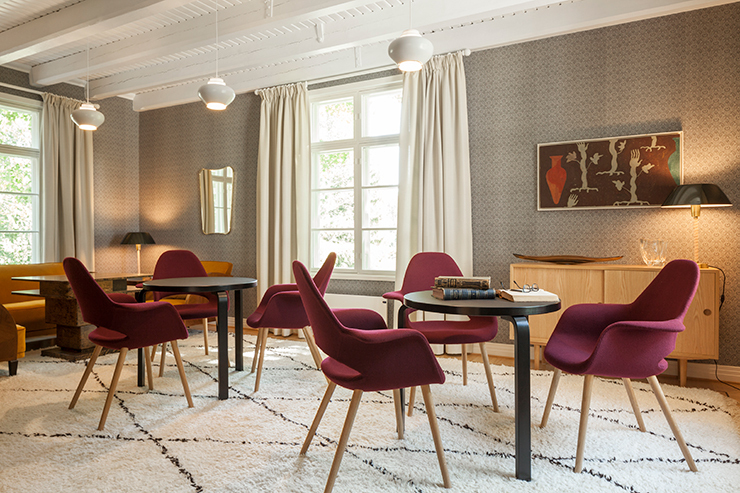 Bringing modern technology into an old building in style was a special challenge. The electricity lines are embedded under wide furring strips around the rooms and the doors. The space is now suitable also for having meetings. An extra door was cut into the log wall to add a kitchen and a toilet.